Throughout 2009 and into the early part of 2010, the Tea Party movement was beginning to prove itself as an electoral force. Election Day results last fall and throughout the primary process this year demonstrated that the party's collective energy and activism were enough to push its preferred candidates past their establishment counterparts to win nominations and elected office. Much of that success came from the image that the Tea Party movement was able to craft for itself. With the help of right-leaning media entities such as Fox News, grass-roots activists were able to market their "brand" as rooted in middle-American values. But the wholesome image of genuine grass-roots activism has been tarnished repeatedly over the past year or so, dating back to the explosive opposition hurled at Democratic leaders at health care town hall forums last summer. Democratic and progressive leaders have worked hard to paint the Tea Party as the dangerous radical right-wing conservative contingency of the Republican Party — despite the fact that many Tea Party activists are disgusted with the GOP as well. In 2010, controversial incidents (such as the alleged spitting incident during the large Tea Party protest this spring in Washington, D.C.) and obvious blunders from noteworthy Tea Party leaders (like the Rand Paul statement about the Civil Rights Act, and Mark Williams' blog post about slavery) hit the Tea Party brand hard. Now the negatives are outweighing the positives. In a recent North Carolina Civitas poll, 33 percent of respondents currently have an unfavorable opinion of the Tea Party movement; 31 percent have a favorable view. That prompts some questions: Between the select gaffes and bouts of inappropriateness — coupled with efforts from the left — has the image of the Tea Party movement been permanently marred? Has the best conservative grass-roots movement in decades been derailed because of a growing image problem over charges of racism and extremism? The only question for conservatives, however, is whether they have learned from the past or are doomed to repeat it. For decades, Republican apathy about engaging new voters for general elections (e.g., African Americans, urban voters, young voters) has been condoned through Southern-strategy tactics. The same ideological legacy that burned the Republicans during the 2008 election cycle is capable of doing the same now. Granted, in both instances, conservatives have allowed select leaders in the limelight to use foul imagery and bigotry (see the Willie Horton ad of 1988 or the Mark Williams statement that the NAACP has made more off of racism than any slave trader ever could) without much accountability. Over recent election cycles, that message has been spun out of relevancy with large measures of success by Democrats and those on the left. 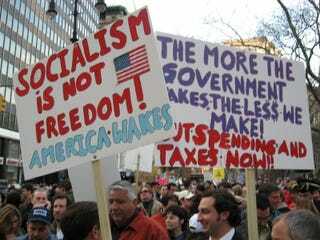 If Republican candidates are to win this fall in a repeat of the 1994 midterm elections, it is imperative that Tea Party activists do not allow the Democrats and progressives to continue to cast the Tea Party in a negative light. Then again, it would help if Tea Party leaders, speakers and candidates didn't continue to provide negative fodder for the news cycles. The conservative image has undergone a tremendous rebound from the depths of disenchantment after the 2008 elections. However, based on recent history, Republicans and conservatives need to do a better job reshaping their image in the media, and especially as seen by the voting public. This is particularly important in terms of their responses to political criticism and attacks from opponents, a trend that must change this fall. Either conservatives will learn the lessons of the past and actively shape and protect their brand — much of which is currently intertwined with the Tea Party movement — or this downward perception of the movement will continue. And if that happens, the most exciting conservative grass-roots movement since the Reagan years will wither on the vine without reaping the harvest of the midterm elections. Lenny McAllister is a syndicated political commentator and the author of an upcoming new edition of the book Diary of a Mad Black PYC (Proud Young Conservative): The Obama Era, Part I (2008-2010). Follow him on Twitter and Facebook.